See more objects with the tag architecture, rococo, antiquity, water, trees, animals, asymmetry, temple, designers, fantasy, columns, fellow academicians, fountains, shell, ornate, artisans, wildlife, romantic, shells, portico, nature, sea life. This is a Print. 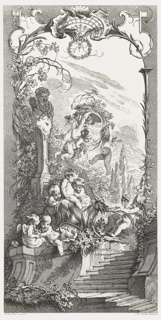 It was designed by François Boucher and engraved by Claude-Augustin Duflos. It is dated 1730s and we acquired it in 1931. Its medium is etching, engraving on white paper. It is a part of the Drawings, Prints, and Graphic Design department. This engraving, a screen design by great artist François Boucher, is iconic for its inclusion of the French word rocaille. 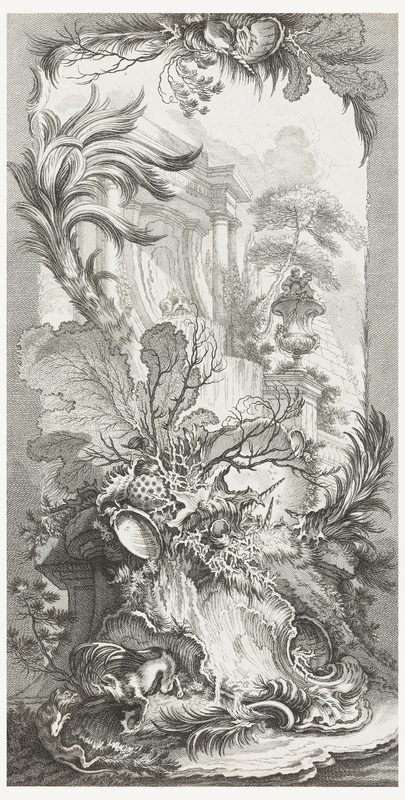 In the eighteenth century, rocaille referred to the irregular rockwork that was used to embellish picturesque grottos and garden fountains but the word has since come to be synonymous with the Rococo as a style. The design exemplifies the fanciful profusion of flora and fauna characteristic of the period.Sinuous plant forms asymmetrically frame a fountain encrusted with shells. Below, two monkeys squabble beside a flowing pool of water. The entire composition evokes motion, tempting the viewer’s eye to travel continuously. There is the sensuous suggestion that one could hear the splashing of water and feel a breeze in the air. 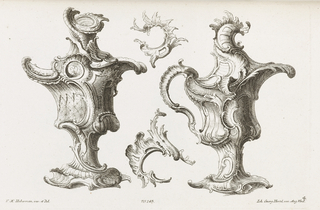 Boucher contributed four of the five screen designs published in the Nouveaux Morceaux pour des Paravents [New Concepts for Screens]. The engraver Claude-Augustin Duflos uses a masterful balance of expressive lines and hatched marks to achieve the scene’s tonal variation and sense of liveliness. Painted in bright polychrome, the design could be applied to a multi-paneled folding screen. Freestanding screens provided privacy and invited painted ornament, creating a perfect synthesis of fine and decorative arts. 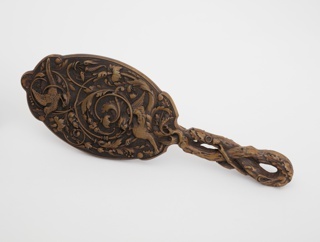 This object was featured in our Object of the Day series in a post titled A Masterful Balance. It is credited Gift of Eleanor and Sarah Hewitt. 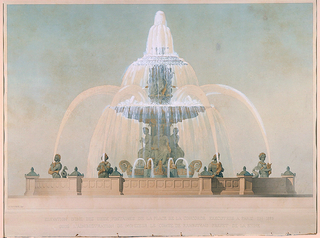 Inscribed on plate, lower left: F. Boucher inv. 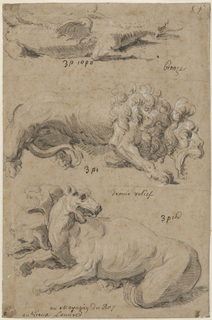 ; lower center: ROCAILLE; lower right: Cl. Duflos sculp.